This all-inclusive kiosk stand for iPad, iPad Air, and iPad Pro 9.7 melds style, functionality, and security in one compact package. The minimalist, modern enclosure is engineered to allow full access to all of your iPad's ports and jacks, while securing the device inside with a powerful key lock in the rear. The interior is outfitted with scratch-protective padding to minimize risk of damage to your tablet while in use, plus cable management loops for a clean look while charging. The stand base rotates a full 360 degrees to allow for quick switches between sides during a transaction, making the kiosk an excellent fit for retail points of sale, reception desks, classrooms, and more. Also included is an optional steel security cable, which affixes to a K-slot on the stand and attaches at the other end to any permanent fixture. 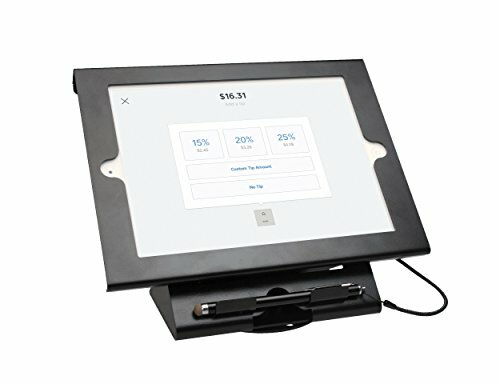 This compact kiosk stand even includes a stylus and elastic tether, plus a built-in holder beneath the enclosure faceplate. This stand mounts easily to a desk, table, countertop, or other flat surface using either the included mounting hardware or strong double-sided adhesive pad. Features: Durable metal security enclosure keeps iPad protected Base rotates full 360 degrees Stylus and tether with built-in holder beneath enclosure faceplate Enclosure design allows full access to charging port, headphone jack, and home button Enclosure mounts to desk, table, countertop, or other flat surface with strong adhesive pad or included hardware Interior scratch-protective padding Optional security cable attaches to K-slot Perfect for retail points of sale, reception desks, classrooms, and more Interior cable management loops keep charging cords out of sight when in use Compatible with iPad (gen. 2-4), iPad Air (gen. 1 and 2), and iPad Pro 9.7; compatible with card readers Specifications: Dimensions: 9.75" x 6.5" x 7" Base dimensions: 6.25" x 4.5" Cable length: 42 inches Weight: 3.66 lbs. Package contents: (1) Security kiosk (1) Security cable (2) Enclosure keys (2) Cable keys (1) Stylus (1) Adhesive mounting pad (1) Adapter insert. View More In Anti-Theft Equipment.